OK, so this has nothing to do with food, but Gemma's nursery does have an animal theme, so that's adventurous, right? Mostly, it's too cute not to share, and this is my best platform for doing so. 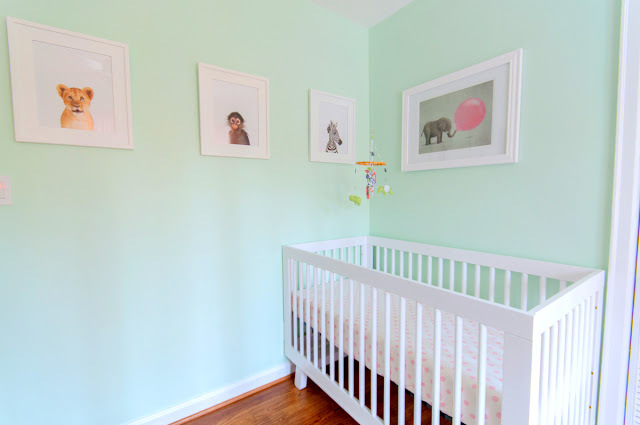 If you hate adorable baby decor, you can skip this post! We wanted something that wasn't too cutesy, and we wanted a wall color and furniture that were gender neutral so we can reuse the room and just change out accessories if we have a boy in the future. After debating grey/blue and mint green, we chose a mint green (Lighter Mint by Sherwin Williams) because it felt fresh but also a little bit retro. We went around in circles about getting a glider. Most of what is out there is horrendously ugly and expensive, and I couldn't bear to buy something I'd hate to look at. I really wanted a mid-century classic, the womb chair, but it proved too large to be practical in our small room. Thank goodness, after much research we found the Little Castle Monaco Recliner. It has clean lines and is quite comfortable. Now that I've spent tons of middle-of-the-night time in it, I am glad we got it even if I do still have a hankering for a womb chair. The concept for the room came from my obsession with the baby animal photos from Animal Print Shop. I wish I had an excuse to buy more of them! We didn't want the room to be overly themed, so we tried to use the African animals with a light hand. In addition to the baby animal prints, the other major animal related purchase was the giant stuffed giraffe, who we have lovingly named Nick Lachey because he always seems to be looking at us (see the source of our random inside joke here). 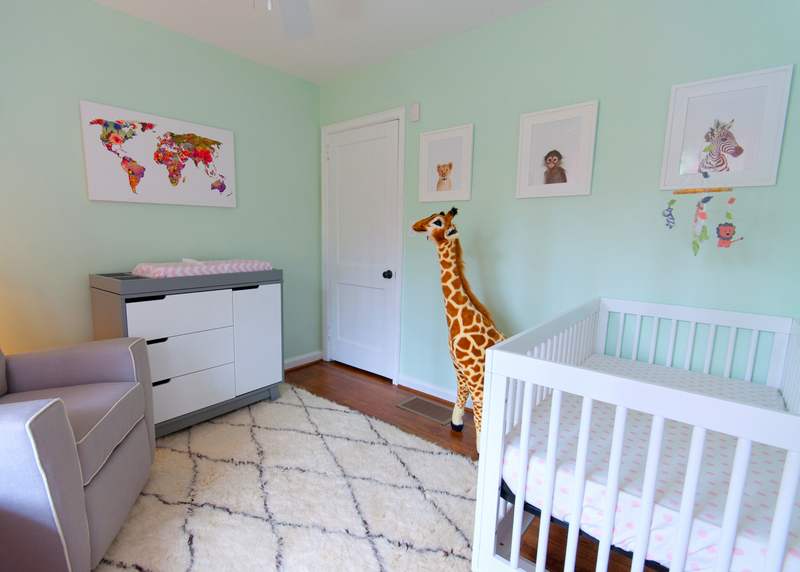 I've since seen this giraffe crop up in tons of online posts about cute nurseries, and it even made a cameo in Jonah Hill's bedroom in 21 Jump Street! For the accessories we went with white, pink and grey, and we'll eventually add some more pops of gold. I loved the modern lines of the Oeuf Sparrow crib but not the ginormous price tag. Fortunately, the Babyletto Hudson crib looks just like it, and although the wood isn't quite as high end, it seems very high quality so far. We originally ordered the gorgeous Land of Nod Monarch dresser, but it was back-ordered for ages, and while we waited, we realized it was simply too big for the room. Instead, we went with the grey and white version of the Babyletto Hudson changer, which has worked perfectly for us so far. Although the measurements supplied on line don't appear to match up, the LA Baby Changing Pad fits perfectly on top of it. I adore Etsy for unique pieces, so we picked up a cute C'Est Tout print and a custom mobile to match our color scheme. How sweet are those little animals? Other art came from Society 6, which features tons of quirky pieces that you can get as prints or on canvas. I love the world map filled with flowers over the changing table. We love to travel, so I like to imagine talking to Gemma about the different places we've been and will go together while she looks at it. A number of gorgeous nurseries online also feature a Moroccan style rug. Madeline Weinrib has a super pricey one and West Elm has a mid-priced one, but we found a ridiculous deal on a very similar one at Rugs USA. It's very soft, perfect for baby to play on, but it does shed a bit. Our linens are grey/white and pink/white featuring super cute chevron and polka dot patterns. They're from Carousel Designs, which is highly recommended by my baby shopping bible Baby Bargains, and it turns out to be a local Georgia business! 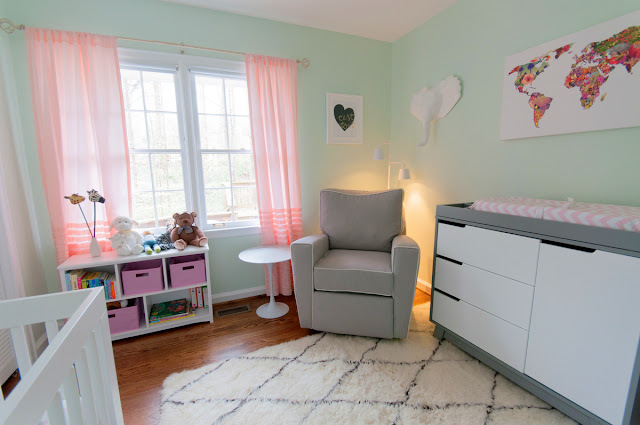 The room is so peaceful and sweet without being too cutesy, and we hope that Gemma will love it for years to come! Papier Mache Elephant Head: No longer available at West Elm but other animal heads are on sale now here.